Bow thruster powered by Solé 35hp diesel engine installed in 2004 and 544 hours use since. Weed hatch fitted to prop. tube. 1 x 90 Amp bowthruster battery also serves the Albin generator. Early 1900 barge converted as a liveaboard look alike Luxemotor, ex passenger vessel. forward twin cabin with 2 single beds (80x2m) minimum headroom of 2.05m and escape hatch of 60x60, en suite heads & shower with domestic type WC. Light bright and airy galley & saloon area with double row of portholes and over 2m head room. Aft to starboard is the galley with five burner gas hob, electric oven & grill., two fridge-freezers (gas, 220v & 12v) dishwasher. To port a bar with ample storage and worktops. Laundry room aft with new (2017) washing machine and separate tumble dryer. At the forward end of the saloon a vast flat screen TV behind curtains and a small office space to port. On deck a large terrace deck ( 8.5m x 3.6m ) with a dip pool and covered by a sun awning. Totally self-contained boatmans cabin aft with galley equipped with four burner gas hob, fridge with ice box (12v 220v & gas). Sea toilet and compact shower, double bed (1.30x1.90) headroom 1.80m/2.20m under the classic period pigeon box that also serves as a seat from on the aft deck. Right aft is the “library” office space completing the internal accommodation. Extra electric fires in cabins, reverse air-con unit in saloon and additional portable air con unit. Central heating radiators in each cabin, engine room and aft cabin, but boiler could be installed. Separate 220V and 24V pressurised water circulation systems. Hot water from 2 immersion heaters. One 380v (when on generator) one 220v when on generator or shore power. Manual crane can be fitted to port or starboard for loading / unloading bikes or heavy kit. Traditional windlass has been modified to electric power with a 380v electric motor. Luxemotor lookalike barge for sale in France. Boatshed Midi Canals is pleased to offer this Dutch barge for sale . A 34m barge on a generous beam of 4.85m giving comfortable accommodation. This boat has until recently been used as a licensed charter barge and now has a new 10 year TRIWV from November 2018.. In the same hands for over 20 years our vendor is a knowledgeable and conscientious born-on-a-barge bargee. The main engine is pure music and will turn heads wherever you go. The four guest cabins are all ensuite and individually decorated and the aft boatman’s cabin can be an owners suite or separate apartment. Presently on a tranquil mooring in the Midi but may soon be moved up to Burgundy where we have an approved B&B mooring available. 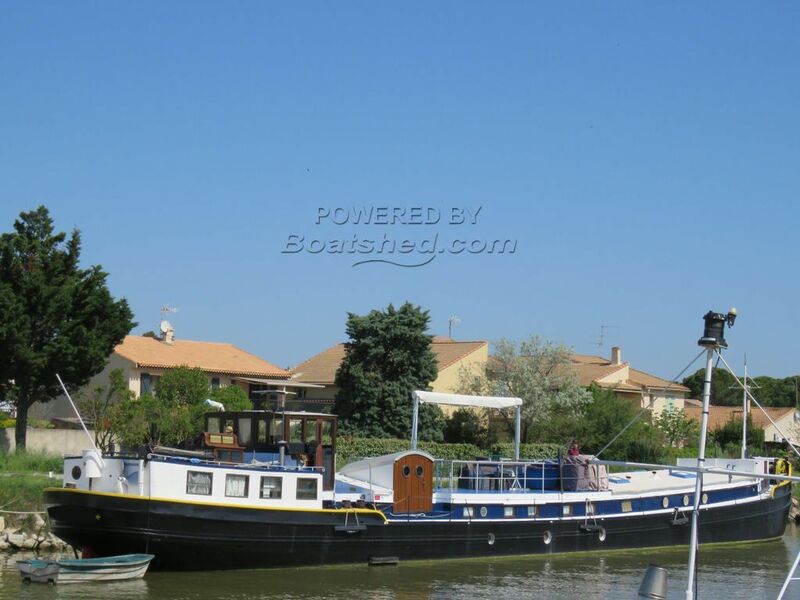 This cruising barge is an ideal cruising home (residential barge) with lots of traditional charm or could easily be used for B&B chambre d’hôtes type business if desired. Brand new 10 year TRIWV from November 2018. For more information and appointments to view, please contact Graham, your local broker at Boatshed Midi Canals. This Luxemotor Dutch Barge New TRIWV November 2018 has been personally photographed and viewed by Graham WHARMBY of Boatshed Midi Canals. Click here for contact details.